GulfImpact.com was just released today by the Timoney Group. Gulf Impact is a powerful demonstration of how Hurricane Katrina and Hurricane Rita affected the Oil and Gas Industry assets in the Gulf of Mexico. Brian Timoney is a GIS professional who really believes in the power of 3D visualization and provides consulting services to businesses interested in reaching the public using Google Earth. The Timoney Group conducted tests to determine how best to present the data. There are over a dozen layers of data including oil pipelines, oil platforms, gas pipelines, hurricane paths, before/after production rates, and analysis tools. They chose a dedicated web site with an entry choice based on the type of person entering (general audience, energy professional, geospatial professional, or you can see the entire list of layers). The bar graphs showing the 2004/2005 production rates help illustrate just how serious the damage affected the industry. Try turning on hurricane paths and the bar graphs for oil production ('04/'05) for example. I highly recommend visiting the site for the full effect though. 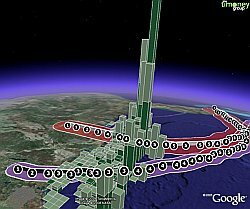 This is a yet another powerful example of how a professional can make dramatic, and useful, visualizations with Google Earth. The Timoney group also produced a visualization for Jonah Gas and a South American Trade demonstration. OgleEarth has conducted an interview with Brian Timoney which is worth reading. Because I am concerned that America is to a large extent funding the Terrorists war against the West by buying so much oil from the East, I was very pleased with the news of last weeks oil discovery in the Gulf of Mexico (Chevron's Jack 2 Well). Now this mornings news of a magnitude 6 earthquake in the Gulf got me to wondering if and how it might effect the Jack 2 well. Using the available data from two different articles, I put the JACK 2 well and the M6 quake about 200 miles apart. I think this is pretty darned close! I would sure be interested in any information and/or thoughts on this matter. I was thinking how strange it is that the quake even happened. 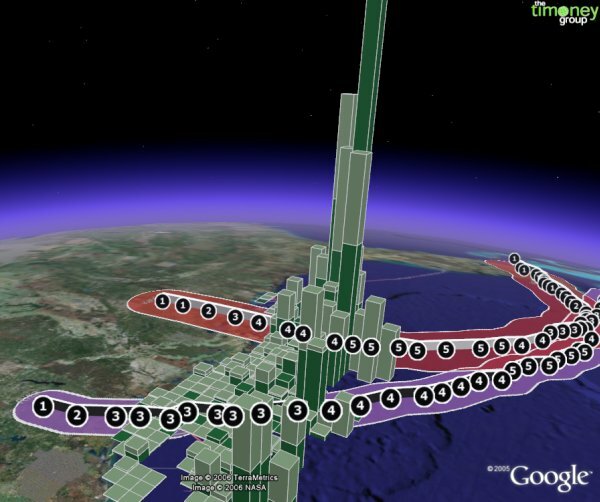 First I saw that the quake happened 250 miles off the coast of Tampa Bay. Then I remembered how at the end of June, The government released a 25 year ban on oil drilling in the Gulf. Want to know how far away the oil companies can drill? That's right... 250 miles west of Tampa Bay. Do your own searches. The truth is being hidden by Big Oil. When you google info on Chevron's big find... You'll start to realize it's not just Jack #2 that's out there. There is another called the Tahiti Project.... and more coming. There is no doubt that this rare and unusual gulf quake was caused by tampering with the earth's crust. Chevron drilled almost 30,000 feet into the ocean floor. That's about 5.5 miles down. It was an earthquake sponsored by Chevron.